On Thursday, I traveled just over an hour from where I’m staying in London to Southall, a predominantly Indian populated section of the city. I had in fact heard several stereotyped comments along these lines prior to making the trip to Southall. However, nearly everyone with whom I came in contact during my visit was more than gracious. As soon as my two friends and I got off the bus and literally walked just two blocks down the road, two smiling, young Indian boys occupying a small sidewalk stand offered us to sample their Indian food. Thinking we’d just be getting a spoonful of whatever they were cooking up, we were more than surprised when the boys handed us a huge container of prepared food equiped with three plastic forks. A combination of rice, beans, nuts, freshly chopped tomatoes, cilantro, Indian spices, and what appeared to be some type of crispy cereal, the dish was layered with flavor and was absolutely delicious. We offered a few pounds for the “sample,” but the boys tenaciously refused. We continued down the street, passing store after store filled with beautiful, vibrantly colored fabrics and elaborate jewelry. Indian clothes are incredibly beautiful, and seeing so many women wandering the streets dressed in the gorgeous saris was an enchanting sight. There were also tons of produce stands lining the main streets of Southall. Every few feet, boxes of mangoes were on display for a relatively cheap price. I love a culture that can appreciate a good mango…seriously, what a great fruit. I met yet another gracious man who sent me off with a free champagne mango, which is currently sitting on my counter waiting for me to excitedly dig in. I found it interesting that on nearly every half block, interspersed between the clothing and produce stalls, were tiny food stands selling cooked sweet corn by the cup. I didn’t get a chance to try any, but the sweet smell permeated the congested air. Southall certainly serves its niche within London. 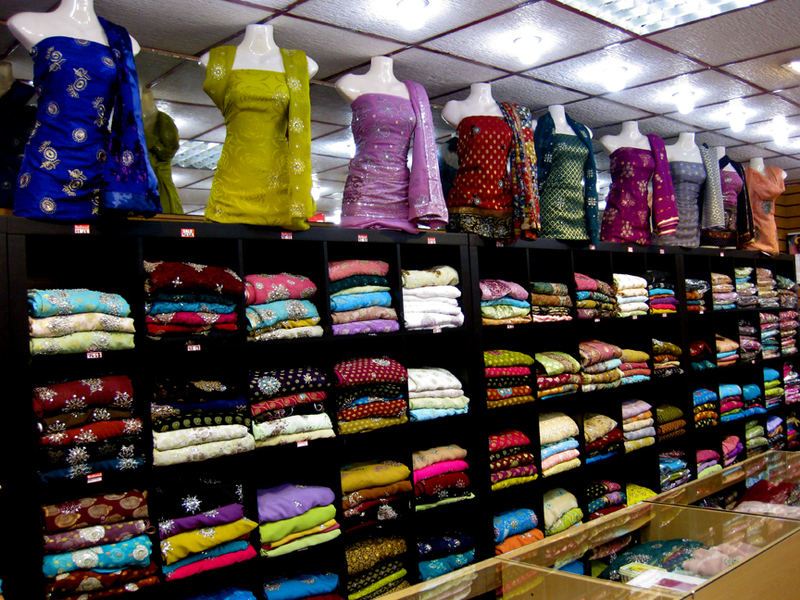 If you’re looking for exquisite fabric or authentic Indian clothing, it’s definitely the place to go. Make sure to check out the Indian food too. WOW! Free food… I’ll take it! Sounds like a great day.